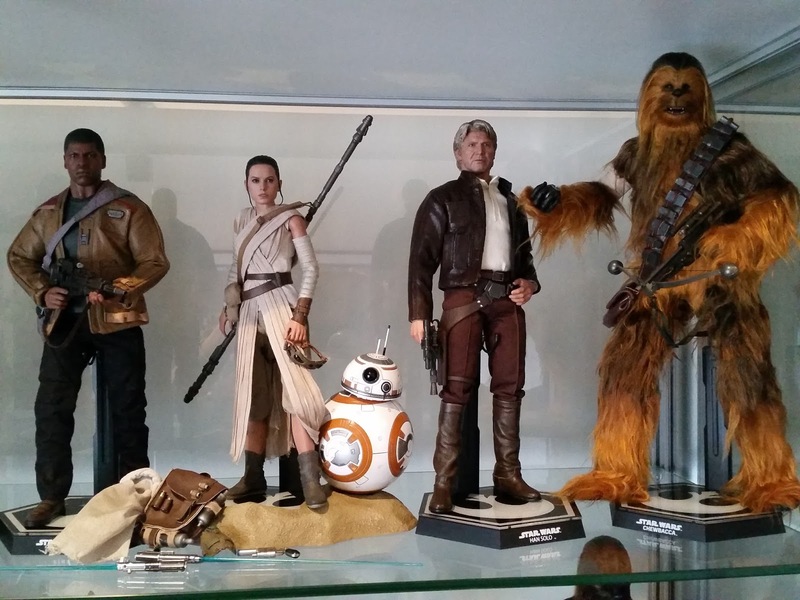 I recently received the new Hot Toys MMS376 two figure set of Han Solo and Chewbacca from The Force Awakens. I do have the previous set from A New Hope, which was fantastic, and so couldn't resist the new one. Early pics of Chewbacca and my up close look at Frank and Sons on my USA trip made me very nervous. The snout looked terrible in those instances. But when I opened mine, I didn't think it looked as bad as I had previously seen. And of course the head sculpt on the old Han Solo looked pretty fantastic. The packaging is the standard Hot Toys Star Wars style, which isn't overly exciting anymore. The cardboard insert is a nice collage of images as always. 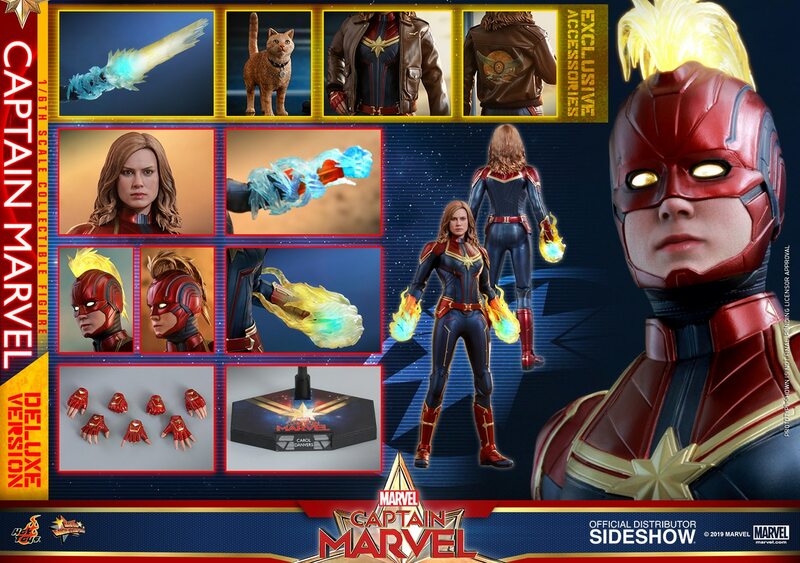 The contents of the set are pretty awesome, with all the accessories you'd expect from the movie. Just as awesome as the first A New Hope set. Straight out of the box, Chewbacca definitely needs some work, but mine is not as bad as some of the other horror pics posted in the Facebook groups. I think overall, the Chewbacca is every bit as good as the previous ANH Chewbacca. As for Han, out of the box the neck collar is a bit weird, but some water futzing will help that. The accessories are great quality, and I love Han's blue winter jacket. The tailoring is really nice with a nice material used too. The weapons are nicely painted and weathered. The only part I don't like are Chewbacca's hands. They are just far too orange in the fur and it makes it look like orangutan hands more than a Wookie! 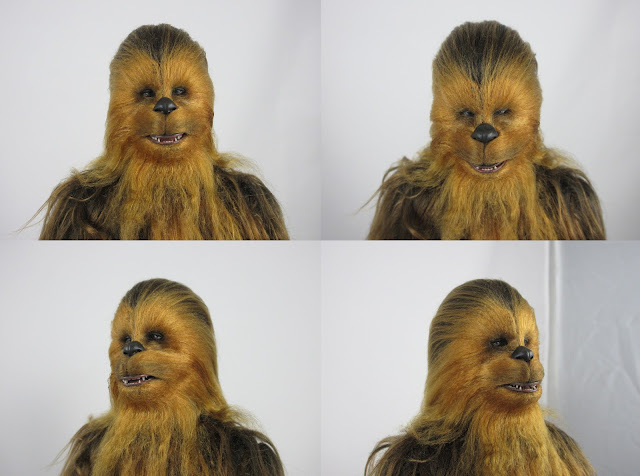 Here's a comparison pic between my two versions of Chewbacca. The ANH version I find far too dark, and the TFA version too orange around the hands and feet. But overall, I'd say I prefer the fur colouring of the new TFA. And from this pic, you can see the face on both versions is far from perfect. I'm not the best futzer, and other collectors could improve the look of both significantly with futzing skills. But in the end, I think both still look great on display and I'm happy enough with the way they look. Closer pics of the face. Using a comb to tease out the fur around the snout and chin definitely improves things. People have done significant mods to close the gap between the nose and upper lip, but there's no way I'm doing such mods to totally reconstruct the face! Han's head sculpt is right up there with the best from Hot Toys I think. The likeness was captured very nicely, although a touch more white in the hair would've been nicer. The smuggler outfit and quality of the jacket and holster is also up to the usual high Hot Toys standard. My holster did have a missing silver stud, but thankfully they include spares that I just glued back into the spot. The little cylinders that go into Han's jacket are easier to insert from the bottom, so just go slow to avoid tearing the jacket! And here they are below together with Finn and Rey. They certainly look great displayed together. I just hope they announce a Poe for The Last Jedi, and perhaps Leia too. It would round out these characters nicely. So overall, I think if you liked the previous ANH set, you'll be equally impressed with this new TFA set. And if you're a TFA fan, I think you'll like the set too of course. Try to look for a bargain at various retailers, and I think you'll be able to pick up the set for a good price!